I have a new to me #High Speed that I bought just a few weeks ago. Replaced the fuse holder on the power box and wiggled a few wires on the power supply I was able to get the game up and running. We played numerous games and ran all the test/diagnostic procedures which tested good. After I got all the parts ordered, I started a tear down of the playfield to clean. I'm still waiting on the new plastic to come in, but I wanted to see how the playfield looked with the new LEDs lights that I just installed. I turned the pin on and the MPU booted up, shut down and booted up again 3 times before the MPU stayed on. It was so quick, that I didn't have time to shut the pin off. Since then I wanted to test to make sure that everything was working correctly after the strange boot up. Here I found during the solenoid test, multiple solenoids out. I have not test the driver transistors yet as I feel that I may have lost a chip with so many solenoids out at one time. This is the 1st system 11 board for me to work on, so I'm not sure where to start to fix this problem. I'm not sure where to start to fix this problem. Start with checking for power at the affected coils. wiggled a few wires on the power supply I was able to get the game up and running. This sounds like a issue that shouldn't be ignored. Which wires? I turned the pin on and the MPU booted up, shut down and booted up again 3 times before the MPU stayed on. This may mean that the power supply needs rebuilding. How about a pic. Here is the picture that you requested. The power wire that I wiggle on to get the mpu to boot up looks like it is the solenoid power connector. The drawings that I have are not very clear. I'm going to start checking power. I could not measure any power so I tried to ground the coils. That did not work either. You've lost power to the coils if grounding them doesn't do anything. Do you have a digital volt meter and know how to use it? Using the schematic, check the vdc supply to the coils...the power is daisy chained from one coil to the next with the same color wire. Red lead on coil lug, black lead on ground strap do you have power? Also check voltage DC at Fuse F2 on the power board. That's the fuse for coils. If no voltage there, switch to AC on your meter and check the incoming AC to the bridge rectifier. Meter Leads on connector 6J1 pins 2 and 3 both red wires. Of course check the fuse itself to see of blown. That power supply should be rebuilt, if you find that the fuse is good you may have some cracked header pins on the back of the power supply. You could remove it and take a pic of the back side. Yes I have limited knowledge using the digital volt meter. Most coils are working other then the ones that I listed above. I'm not sure how to check the Flasher #1-3 and left and right hideout relay. I have power at fuse #2 and the fuse is good. But know I got another problem that should work first. The power supply I think keep losing it's 5 volts so I need to cap the power supply. Just to be on the safe side I will remove the old solder (using a Hako FR-300) and re-solder the pins. I'm also going to order a cap kit from GPE for the power supply. Anything else I should order while I'm at it? Looks like GPE is closed for the time being. I need to find another source. Any suggestions? I would check the connectors to the board. Check the pins on the board. I had a lose wire in the connector, pushed it in and it solved the problem. Caps will not fix a non existent five volt, it will remove the AC from the five volt line. You need to test it to find out where the five volt is dieing out at so you get all the parts you need. Shipping is a killer, you only want to order once. If the header pins are burnt they will need to be replaced and not just resoldered. Got it. Hold off on ordering till I figure out why and where i'm losing the 5 volts. Would you happen to have a readable copy of the schematics? The copy that I have downloaded with the manual is very blurry. I then should be able to know where all 5 volts lines are for testing. The copy that I have downloaded with the manual is very blurry. I then should be able to know where all 5 volts lines are for testing. Connect voltmeter to the five volt test point and turn on game, watch the meter for fluctuations while Cpu is booting. 5 volt should be steady and at least 4.9 volts and above. Yes it holds 4.9 volts steady while booting up on the power supply. For the +12 volts I measured +10 volts. On the -12 volts I measured -13 on the power supply. Oh and thank you for the pictures. Far better than what I have now. For the +12 volts I measured +10 volts. This is a bit low, should be @ 10.5 and above. New caps and diodes on the power supply with help with this. At a minimum replace the 8 electrolytic caps and D-1 thru D-6 with 1n4007 diodes. Thank you Grumpy, I will add the diodes to the order. Do you have any suggestions on where to start to fix the solenoids? Are the fuse holders on the power supply a tight fit to the fuses? Here is a pic of the power supply connector. Check all 3 red and 1 red/white wire for 34 volts dc with the game powered on. Let me know if one of them is dead. I got 29.6 volts for each wire. 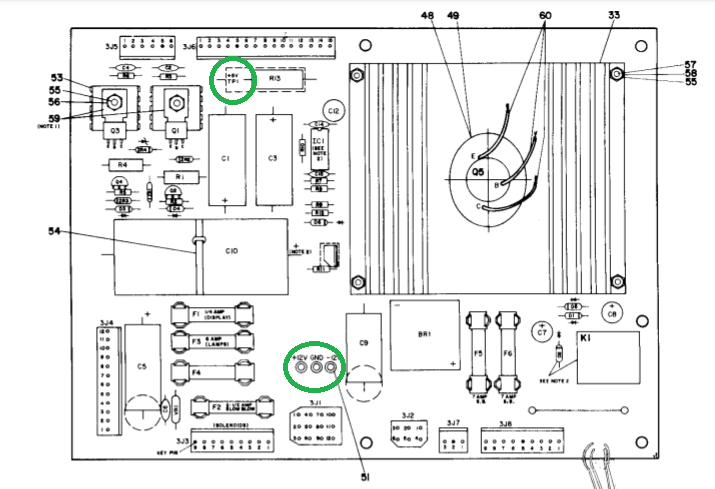 Good, now find the big molex connectors under the play field that go to the play field. Use a pair of channel lock pliers and squeeze both half's together. You can test these same red wires on both sides of the connector to see if you are loosing power at the connector. Ok I found that 2 red and 1 red/white wire that go to the playfield while the other red one goes to the back box somewhere. Looks like it goes to the 4 large light bulbs on the back box door. Not all of the solenoids that are not working are coils. Just listed as solenoids. The out hole, ball release and eject hole will be coils while flashers 1, 2, 3 and 4 are lights. then what is left is the left and right hideout relays. You need to follow the red wires going to the play field. The red wire going to the back box is for the knocker and the beacon. Found it. I feel pretty stupid now. It was a red wire that when to one of the flashers that I removed when I tore everything apart to clean and polish the playfeild. Look at the bright side, you were able to work thru a problem and correct it. Nice job. Now rebuild the power supply and you will golden. What would we do without you Grumpy? Helping us all play ball with your troubleshooting threads. Thanks for sharing your knowledge .